The “Impregnable Quadrilateral”: Bobby Jonesin 1930 with his trophy haul from The [British] Open, U.S. Amateur, British Amateur and U.S. Open. The pinnacle of Jones’ peerless career came in 1930 when in a single season he won what became known as the “impregnable quadrilateral”, in claiming the U.S. Open, U.S. Amateur, The [British] Open and British Amateur titles. Thirty years later, Palmer was the best golfer in the world. He won his second Masters title in that spring of 1960, followed up with an incredible late charge to win the U.S. Open at Cherry Hills, and was drawn to St Andrews that July to make his debut in The Open. He wanted to emulate Jones—three times The Open champ—but with the rapid evolution of the professional game since the end of the Second World War, Palmer saw the potential for a modern equivalent to Jones’ quadrilateral. The idea resonated with golf’s media and governors alike. The R&A was delighted to have Palmer in The Open field for the first time—particularly in 1960, marking its centenary—and The Open’s organizers were doubly pleased when Palmer’s presence saw gate receipts from the previous year nearly double. Like the profile of golf’s oldest major championship, profits soared. 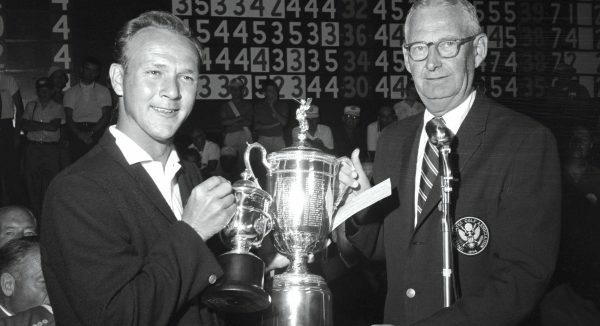 Palmer could not quite claim the third corner of his Grand Slam at the Home of Golf in 1960, finishing, agonizingly, just a shot shy of Australian champion Kel Nagle, but a new precedent had been set and when he returned to British shores in 1961 Palmer recalled, “The Open and I had some unfinished business”. He lifted the Claret Jug at Royal Birkdale and successfully defended his title at Troon in 1962. Palmer could not complete his career Grand Slam, try as he might. The PGA Championship would remain elusive, but since 1960 there has been no doubting which quartet of tournaments remain pre-eminent in professional golf.